A wireless repeater allows point to point wireless links ,also referred to as ptp wireless, to cover greater distances and get around obstructions that may limit line of sight (“LOS”). 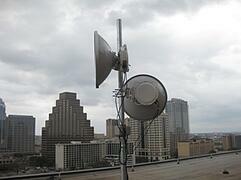 Wireless repeaters are also used to provide a greater signal level where needed. Point to point wireless backhaul, both licensed microwave links and a unlicensed wireless Ethernet bridge, traditionally require line of site for the point to point microwave communications to properly work. There are some ptp wireless technologies like MIMO and OFDM used by some unlicensed wireless Ethernet bridges that can help with non-line of sight applications but in general LOS must be established for a wireless point to point bridge to work. In some cases there may be an obstruction like a building, a hill, or possibly trees that would create a near or non-line of sight situation for a wireless link. A solution for getting around an obstruction to create good line of sight is to use a wireless repeater. Two types of wireless repeaters are used. A passive wireless repeater reflects the signal from an active transmitting wireless antenna through a passive antenna or a reflective panel to the receiving wireless antenna. In this case there occurs path loss that lowers the microwave communication system’s gain. An active repeater is when you essentially have two separate point to point wireless bridges that are connected together at the wireless repeater site. Using an active wireless repeater provides the most effective solution. When two microwave radio units are directly connected back to back (can be daisy chained together or patched together with a Ethernet switch at the antenna repeater site) there is minimal signal loss and almost no additional latency added to the network. An example of this would be to have a wireless point to point link from a building to a rooftop of another building (whether a building used by a client’s organization or a leased rooftop access) and then another point to point wireless link from that rooftop to the other building needing wireless connectivity. The distance of a point to point microwave link depends on the wireless frequency, antenna size, and output power used. In general point to point microwave communication can go upwards of 50 miles. In some cases a client may need to create a wireless backhaul greater than that. In this case using an active wireless repeater will allow a wireless link to be expanded over large distances. In a typical example of this solution is using microwave communication towers as a wireless repeater site. There are thousands of wireless communication towers that allow for clients to lease space off of completing their wireless backhaul networks. Wireless repeater communication towers are relatively inexpensive to have installed. Leasing high speed bandwidth form a telco or installing dark fiber is extremely expensive. Point to point wireless backhaul or creating point to multipoint wireless Ethernet bridges for last mile connections have a rapid ROI (typically less than 6 months with no reoccurring costs). Adding a tower into the solutions may only add 3 to 4 months until the CAPEX achieves and ROI. Free standing towers from 40ft to 80ft in height can be installed from $25,000 to $45,000. That is not much money when you look at the big picture (see "Wireless Backhaul Communication Towers are a Great Investment").